. . . they were playing it on WABC, so everyone will have heard it . . . The Brown Bag Special was a regular feature of Bill Brown during many of his 36 years at WCBS-FM. Bill's show of October 20, 1989 was his 20th Anniversary show, and he is presented with celebratory goodies by PD Joe McCoy while counting down the Top Five New York City hits from October 20, 1969. Brown's first big Top 40 radio gig was at KGB in San Diego. 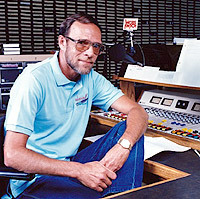 His connection to the Drake organization resulted in a 1967 move to WOR-FM in New York City. Brown was hired by WCBS-FM in 1969. Brown passed away on October 9, 2011.